Alain Hubert, Johan Berte, Nighat Amin and their colleagues at the Brussels-based International Polar Foundation have been hard at work to make the dream of the first ever "zero emission" Antarctic station a reality. Once completed, the Princess Elisabeth Station will be the first functioning Belgian station in the Antarctic in more than four decades, and the scientific research that will be carried out there once it is completed will be part of Belgium's contribution to the activities of the International Polar Year (IPY) 2007-08. Taking the first pioneering steps towards making the world's first "zero emission" station has been a personal challenge for IPF's founder Alain Hubert. Hubert and his colleagues at IPF wish to prove that it's possible for Belgium to respond to the challenge of climate change by constructing (with the help of its financial sponsors and technical partners) a station in the Antarctic that runs entirely on renewable energies. So far three Belgian Antarctic Research Expeditions (BELARE) have been undertaken during the past three austral summers, and all have accomplished the objectives they set out to achieve. The survey expedition in 2004-2005 settled on an ideal location for the base to be constructed at Utsteinen Nunatak. The following year a logistics survey was carried out. During the last austral summer 2006-2007, the BELARE team successfully prepared the base site and set up the first of eight wind turbines that will provide the station with one of its carbon-neutral sources of energy. 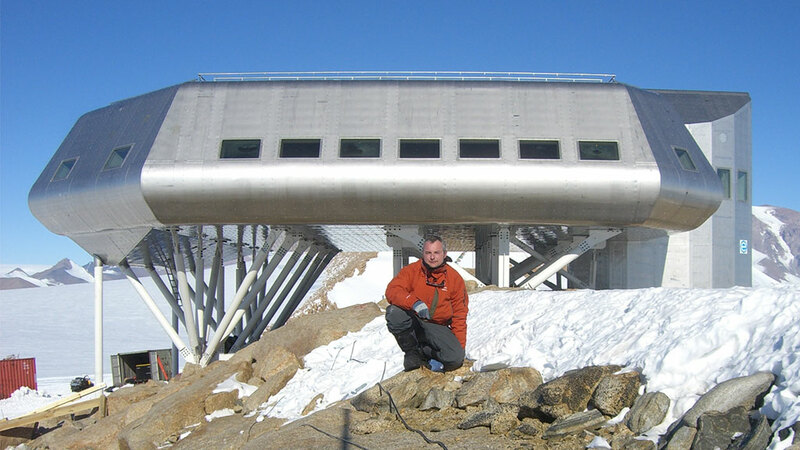 Johan Berte is Project Manager for the Princess Elisabeth Station project and is in charge of managing the design, construction, and logistics procedures. Along with Alain Hubert and Nighat Amin, he has participated in all three BELARE missions and will oversee the construction of the station at Usteinen Nunatak during the upcoming BELARE expedition 2007-08. Once completed, the Princess Elisabeth Station will be the first "zero emission" Antarctic research station. Why will this be such an extraordinary achievement? What is really extraordinary about the project is that we were willing to be pioneers in building an Antarctic station run entirely on renewable energies. You won't find any project comparable to ours at present. As far as building Antarctic stations goes, there is a tendency to play it safe and stick with what you know, with methods that have been tried and tested and not to deviate from the norm too much. But what it comes down to is a question of priorities. If making a zero emissions station is not high on the list of priorities, then no time or money is going to be invested in making it a reality. Priorities in what goes into building Antarctic stations have evolved over time. In the 1970s for example you saw an increase in the amount of scientific research being done in the Antarctic, most of which required instrumentation panels to be installed in stations, and this in turn increased the energy needs of the station. In recent years there has also been an increased priority on optimising time (since missions and researchers cost a lot of money) and increasing comfort levels for the researchers and crew. In the last five years or so, priorities have shifted towards a greater role for renewable energies in powering research stations. Not only have governments with stations in Antarctica been becoming more and more environmentally conscious, but they have also had to face the reality of increasing fuel prices. If the price of fuel continues to increase, then using more renewable energies and optimising energy efficiency will move higher and higher on the priorities list. Every country that has a station in the Antarctic is paying attention to what we are doing with great interest. If we can prove that running an Antarctic station entirely on renewable energies is possible, others will want to follow our lead. Many Antarctic stations have renewable energy sources such as wind and solar power to provide supplemental energy, but their primary energy systems are run by fuel-powered generators, and many have not been designed to optimise energy efficiency. Change might mean increasing stations' reliance on renewable energies as opposed to fuel-run generators and increasing their energy efficiency, or even redesigning or rebuilding new stations in cases where old ones are inefficient. We're already seeing some stations adopting more renewable energies as a power source as they are being upgraded. Is there anything particularly groundbreaking about the technology that is being used for the station? Although a lot of the technology we're using in the station is cutting-edge, it has all been tested in real-life situations before. Also, the energy for the station will be provided by wind, solar thermal and solar passive energy, all of which aren't new concepts. What we're doing that is groundbreaking is integrating several different technological systems and optimising their efficiency and using them in an Antarctic station. This has never been done before. Princess Elisabeth Station will be about twenty times more energy efficient than a comparable Antarctic station (a station that is relatively new, of the same size and housing the same kind of research team and equipment). Why was it decided to build the base on top of Utsteinen Nunatak in the Dronning Maud Land? There are several reasons why the site was chosen. First of all, its geographic location is quite ideal. The site at Utsteinen is 200 km from the edge of the ice shelf and at the foot of the Sør Rondane Mountain Range. This provides a wide range of scientific opportunities, as one can easily go to the coast, the glaciers, the mountains and even the high plateau. The site is also located in the middle of a 1100 km space between the Russian Novolazarevskaja station and the Japanese Syowa station, creating a new link in the research station network in East Antarctica as well as closing a logistical gap in the region. The geography of the terrain is also ideal for the base. The ridge the base will be built on is relatively flat, consisting of weathered granite. Building the base on top of rock instead of snow allows for good stability. It is also highly practical that the ridge is surrounded by light snow, not only because light snow can be melted to provide us with water, but because this allows you to access the station by land vehicles and small aircraft. The two garages housing equipment for the station will be built below the ridge, buried in the snow. The wind at Utsteinen was another factor that was important for choosing the site. The wind is constant yet not too strong, which allows for a constant supply of wind power. The way the ridge is situated makes it possible for the wind turbines to be set up perpendicular to the direction of the prevailing winds. This allows the wind turbines to be free-rotating without being in the wake of the other turbines. What remains to be done before you head to the Antarctic on the next BELARE expedition scheduled for the next austral summer 2007-08? A big part of the work that we still need to do is logistics preparation. Getting everything there will be challenging, so there will be a lot of planning and preparation until the last moment. We also are spending a lot of our time making fine adjustments on the station design. Although the design has been finalised, there are still many things that need to be completed. For example the testing procedures for all of the systems in the station (water, electrical, ventilation, etc.) and ironing out details concerning the communications equipment. We also are still finalising the specifications of the science programmes that are going to be carried out once the station is set up and running. If you could sum up the project with one word, what would that word be? Why? I would say "extreme." So far the whole project has been quite extreme - not extreme in a bad way but extreme in a good way. We're taking a pioneering step forward in the domain of sustainable development, not to mention pushing our own personal limits with this challenging project. No one has ever tried to do what we're doing before. We're venturing into new frontiers, and you have to be willing to go to extremes and deal with extreme situations in order to do this. Johan Berte is the head engineer for the Princes Elisabeth Antarctica research station, constructed in the Dronning Maud Land in Antarctica during the International Polar Year (IPY) 2007-08. He has been repsonsible for the design of the station and its proper functioning following its completion.